Two intruders are captured in the grounds of Colditz Castle, the most secure POW camp in Germany. At first, the guards think they’re dealing with British spies. But the strangers arrived in an advanced travelling machine, the like of which they’ve never seen before. With this TARDIS in their hands, the Third Reich might triumph after all. Sylvester McCoy is the Doctor in Colditz. For a television show that uses history in the way that Doctor Who does, and a British show at that, Nazis have been rarely used as villains. 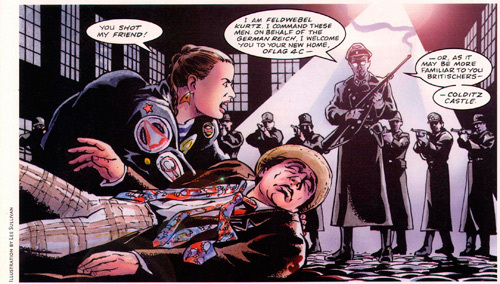 While World War II has come up on numerous occasions (Victory of the Daleks, The Empty Child/The Doctor Dances, The Curse of Fenric), the Nazis themselves have popped up rarely – in the Seventh Doctor story Silver Nemesis and in the form of none other than Adolf Hitler as a hapless comedic figure in Let’s Kill Hitler. Of course, the Daleks themselves are based off of the society of Nazi Germany, but for a show with nearly 50 years of history, the Nazis, who are the most hated villains in fiction outside of Walter White, have rarely been used. Colditz could have easily just been a “paint by the numbers” audio. Take a situation, throw in the Nazis as the bad guys, cook until warm, and serve on a CD or via download. Instead, we get a tense, rousing prison break style adventure, complete with one of Seven’s convoluted-until-it-makes sense schemes and several non-cardboard villains, and a long-term character taking a major step forward in development. Colditz is the first story where the brilliance of the Seventh Doctor’s scheming is on display. The Fearmonger saw us joining the struggle in media res, while The Fires of Vulcan saw the Doctor accept his fate for 3/4th’s of the story before snapping out of his malaise and fighting to save the day. From the moment the Doctor is captured, he’s working his captors. Even though he’s not in the driver’s seat in this audio and at the mercy of his captors, the Doctor mains as much control as he can over his circumstances. Playing up the curiousity of the head doctor, convincing Kurtz he’s not as important as he thinks he is, and slowly unraveling the plans of Doctor Klein, all while dancing his way around their conversations and using his sleight of hand on several important occasions. It’s not all honey and vinegar, though, as the Doctor blasts Klein about her glorious Reich in a fiery rant near the end, and very few people can rant like a determined Sylvester McCoy. The Fires of Vulcan is Sylvester McCoy at his best so far with Big Finish, but Colditz is the Seventh Doctor at his best. Coming back to the role of Ace almost a dozen years after leaving it, it was weird during the earlier audios to hear Sophie Aldred, married mother, play a spitfire 20-year old. She still sounded exactly like Ace and played her the same way, but there was a bit of a disconnect, at least for me. In Colditz, however, Ace grows up, and not in the Virgin New Adventures way. From the beginning as a captive of the Nazis, Ace is defiant to her captors and mocking of them. It fits perfectly with how young people today views the Nazis – ineffectual villains. She taunts Kurtz, spits in his face, and defies him as best she can, until he turns the tables on her by threatening not only her, but the Doctor. Then, she gets scared, and you could almost hear the switch going off as Ace realizes just how much trouble she’s in. During the course of the serial, we learn Ace’s real name, Dorothy McShane, and at the end of the serial, after seeing something incredibly haunting and realizing just how close her and the Doctor came to death, she drops the “Ace” moniker and asks to be called Dorothy from now on, something that continues throughout the course of Aldred and McCoy’s run on audio. I have to give kudos to Big Finish for going this route, as it could have been easy to just keep Ace static and as she was. Instead, the writers decided to actually give the line a sense of continuity and development, building upon the foundation set by the Sixth Doctor and Evelyn Smythe. By taking a “canon” character and changing her in this way, it not only allows Ace/Dorothy to grow as a character, but let Sophie Aldred do so as well without having to resort to the “Acespeak” of the final TV season. There’s also someone else we’ll see down the road. Feldwebel Kurtz is played by none other than David Tennant, in his first of two Big Finish productions. As soon as Kurtz steps on the scene, fresh from gunning down the Doctor, Tennant takes over. Even if you didn’t know David Tennant was Kurtz, his performance is still memorable. He’s slimy, he’s stern, he follows orders to the letter, and he demands respect, even though he rarely receives it in return. You can hear the anger and frustration in his voice as he threatens Ace, even when he speaks at barely a whisper. He’s a vile and despicable bully who wants only a measure of respect, desiring it above even his beloved Third Reich. Even to the bitter end, Kurtz demands that respect, and even while the Doctor and Ace play upon that weakness, it almost leads to their own demise. The script is a cracker. Steve Lyons, who’s written several novels for Doctor Who as well as the author of several WARHAMMER stories, does a fantastic job with the dialogue, the exposition, audibly laying out the setting and locations, and coming up with a great master plan on the part of the Seventh Doctor. When the plan is revealed, it’s one where you listen to it several times going “ok, ok, ok…wait…no, go back…” and then it all clicks. Of course, there are escape attempts, done with tensions and suspense as things go wrong, but then right, and then wrong again. Doctor: Ace, do you have any Nitro-9 in your knapsack? Doctor: Excellent. Blow open that door. Now, usually I praise the Sound Crew for Big Finish to the skies, and while they do their standard fantastic job in putting the listener right into the middle of a German POW camp and the surrounding forest, I must critique them before I can praise them. There are several times where characters are in a jail cell or solitary confinement, and the audio is modified in such a way that was an attempt to add a slight echo, but instead added a harsh buzz. The majority of the action takes place outside of these cells, but it’s often enough that it has to be pointed out, and is a bit of a downer. On the other side, one of the characters in this audio suffers perhaps the most gruesome death in ALL of Doctor Who. Their fate, and how they meet it, caused me to yell “Jesus Christ” on a crowded commuter bus, even as I scrolled back to listen to it again. The sound guys had a FIELD day with the character’s death, and it was a method of demise that I’m surprised hadn’t been done earlier in the series! 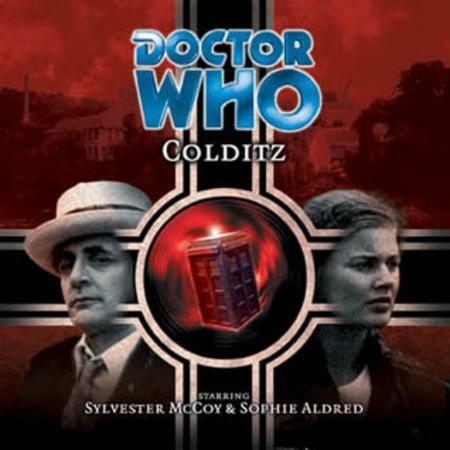 Synopsis – No Daleks, no Hitler, and no aliens other than the Doctor, Colditz is a top-notch audio, with McCoy, Aldred, Childs, and Tennant in fine form as they scheme, threaten, and try to one-up each other in the heart of Nazi Germany. 5/5. Peter Davison is the Doctor in…Primeval. This entry was posted in Big Finish Review and tagged Ace, Big Finish, David Tennant, Doctor Who, Nazis, Seventh Doctor, Sylvester McCoy, TARDIS. Bookmark the permalink.